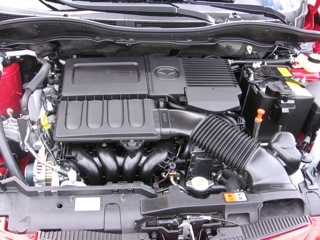 2011 MAZDA2 – ZOOM ZOOM? Here in the US we don’t have much appreciation for what’s known as “B-Segment” cars, or subcompacts. Think of the Toyota Yaris, Nissan Versa, Scion TC, Chevy Aveo and now the new Ford Fiesta. Not the case in Canada where nearly half the market is either subcompact or compact cars. Hence, we’re here in Montreal for the launch of the new Mazda2. This class of cars is meant to be small, economical and inexpensive which usually means not much panache. Mazda, a brand known for panache, would like to change that. The Mazda2 has been around for years in the Asian, European and Australian markets but it’s just now coming to North America. 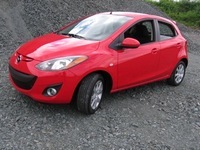 This fresh 2011 Mazda2 represents the third generation, but the first to be sold in the North American market. The other markets will get the new design soon. We’re assured by the Mazda folks that only a handful of parts are shared with the new Ford Fiesta, though they start with the same “architecture” (not platform). Virtually the entire car was designed and engineered to be distinctly Mazda, not a Fiesta clone. I think they’ve done an admirable job. First, take a look at the styling. The proportions feel right with wheels extended out to the corners, C-Pillars right over the rear wheels and details that exaggerate the breadth of the car. The big Mazda grin, bold front wheel bulges, character lines swooping upward and rearward, broad-shouldered rear flank and wide, sloping tail clearly say Mazda to those who know and appreciate the brand. 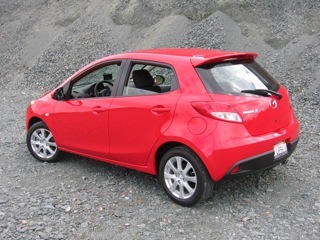 For subcompact shoppers who are not particularly car-savvy it will stand out as an eye-catcher. The design theme is stated by Derek Jenkens, styling and design manager, as “Zoom-Zoom concentrated,” that is, giving it the look of going fast even when standing still. Of course, that’s a pretty common statement of a design goal, but I think they’ve done a good job here as well. Just looking at it parked at the curb makes me want to hop in and go. Inside, the challenge was to make it look and feel like more than a simple, white-bread economy car. With some shinny black trim, nice textures on the plastic parts and unexpectedly nice fabrics on the seats and headliner it does not feel or look cheap or tawdry. It’s certainly far from a luxury car, but it won’t make you feel like you’ve sacrificed too much in choosing this small car. The design inside has enough aesthetic interest to avoid being boring and the controls are intuitive and tactiley excellent. The shifter comes out of the lower dash not the floor leaving more room for stuff beneath. Interior volume is about equal to its competitors. More emphasis was put on the needs of front seat passengers since statistically the rear seats in this class of car are seldom used. 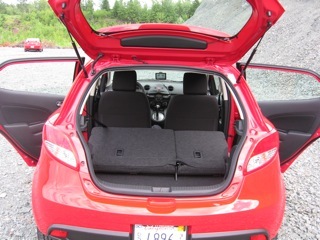 The rear seat backs fold 60/40 to accommodate 27.7 cubic-feet of stuff – again, about average for the class. For better visibility the rear seat headrests adjust to the passengers’ torso height and retract out of the way when no one is back there. And, to get another inch of headroom the hatch hinges are designed with an external bubble. That’s an impressive little design trick. The big question in my mind after the technical presentation was whether I could be happy with only 100 horsepower, no matter how attractive it looks. Well, I can’t say I was thrilled, but I didn’t feel too deprived behind the wheel, particularly with the five-speed manual transmission. We took the car out into the rural countryside southeast of Montreal and let it loose, so to speak. The little 1.5-liter four-banger, with variable valve timing and other nods to modernity, makes 98 pound-feet of torque to go with that 100 horsepower - barely adequate for the job. Now remember, the Mazda2 is not meant to be a hot performer, it’s meant to be a stylish and fun way to get around economically. With the manual transmission it’s rated at a respectable 29 mpg in the city and 35 on the highway. The optional automatic is expected to get 27 and 33 mpg respectively. The Mazda2 has a new “brake override” system that will be on all Mazda products by the end of next year. We’ll probable see that on most cars because of Toyota’s tragic experience. It may be a superfluous system, but . . . who knows? I think the jury is still out on that whole fiasco. Speaking of brakes, this is one of the few cars on the market that still has drum brakes in the rear - although, it’s pretty common in this B-Segment class where the expense of discs back there would add no real value in stopping ability or durability. We did wind it up full-throttle with both the automatic (no manual mode but you can select 2nd and 1st gears with the shifter) and the 5-speed manual transmissions. It sounded strained at red line, which is about 6200 rpm. The Mazda2 was remarkably quiet inside when we weren’t thrashing it though. They’ve done a great job of insulating us from unpleasant road and car noises. Ride and handling are well balanced. With this redesign the Mazda engineers used high strength steel judiciously to both save weight and to stiffen the chassis. It weighs just 2,300 pounds and over the often dismally rough Canadian roads the body structure felt exceptionally stiff. The suspension is tight enough to stay under control over the rough roads, but compliant enough to provide a comfortable ride. Steering is electrically assisted which saves a bit more weight but in some cars feels squirrelly. While I initially felt a little incongruous feedback in the steering at slow speeds in the city I apparently got used to it, or it went away. I noticed it no more the rest of our drive. Offered in just two trim levels with two transmission options and one engine, Mazda has kept the whole project simple. The base level Sport, at $13,980 MSRP, comes standard with manual transmission, power mirrors, locks and windows, tilt steering wheel, AC, 15-inch steel wheels with wheel covers, remote keyless entry system, AM/FM/CD player with MP3 capability, audio jack, rear window wiper/washer, 60/40 rear seats and the full compliment of air bags, stability control, ABS, traction controls and other safety equipment. The Touring version, at $15,435, adds alloy wheels (still 15-inch), upgraded seat fabric with red piping, roof spoiler, chrome exhaust tip, fog lights, leather-wrapped steering wheel with audio and cruise control, and more speakers. No sunroof, navigation system or other luxuries are offered as options, though you can get a Garmin as an accessory. Destination charge is $750 and the upcharge for the 4-speed automatic transmission is $800. Mazda expects to sell about 20,000 Mazda2s in the US and the same number in Canada during the first year of availability. As we saw during the launch visit to Montreal, the subcompact, or B-Segment, is much more popular in Canada but the total market is much smaller. It remains to be seen whether US buyers will embrace such a small car even with the Zoom-Zoom factor while gas prices continue to hold at reasonably low levels. You’ll find the new Mazda2 at your US and Canadian dealers about mid-August, so zoom down there and take a look.